Thanks your welcome letter of April 25th. I can imagine how lonely you must feel, living in that house by yourself - why don't you try to get some performers each week from the Empire — it would be better than having a local lodger - of course I don't know where you are located. Maybe tool far from the Theatre for that - however, I think you should have someone staying with you Trixie — surely you could find a reliable person. Perhaps a married couple who are working. Why don't you advertise? Do you own the house, Trixie or are you paying rent? Am not trying to pry into your private affair's dear, was only thinking if I knew how you were situated, I might be able to give you some support - Note you are writing to Jackie Harrison — I haven't heard from him for a long time — he did'nt answer my last letter — poor Jackie, am afraid he's lost all ambitions to do anything anymore, it's really sad, a sweet guy & all that talent gone to waste. Do you ever hear from Jack Graham? I have'nt for q2uite a while. Well, all for now Trixie, Eda joins in love & kind thoughts - drop a line when you feel like it, always happy to hear from you. Needless to tell you, I was shocked to hear about your terrible accident its a miracle you were'nt killed, can't tell you how very very sorry I am Betty to get the bad news of your condition, thats really awful. I can imagine Wayne is plenty upset about it, I certainly sympathize with you both in your misfortune & tough luck. 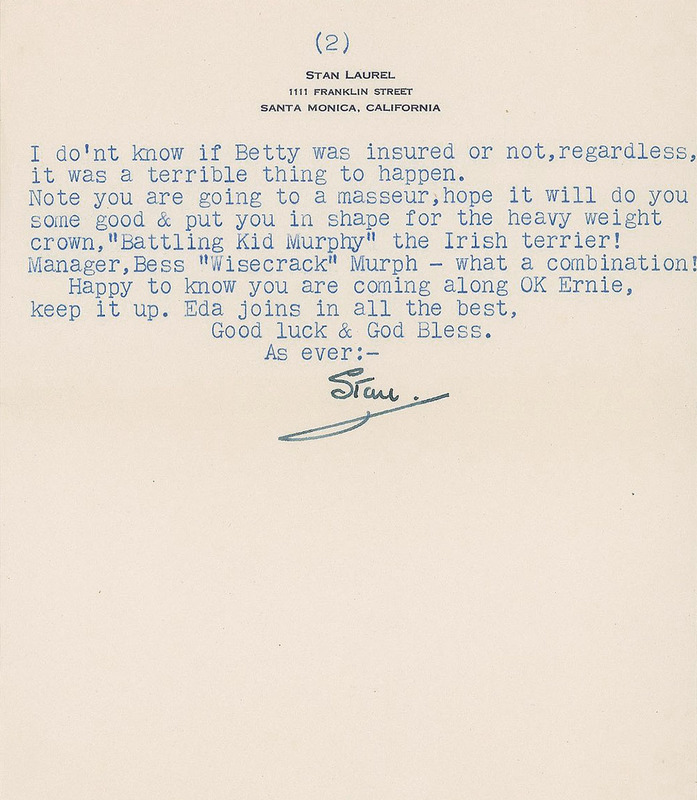 A strange thing, only last Saturday I got a letter from Ernie Murphy (enclosed) the same thing happened to him, but evidently not quite as bad as yours, as he was moving at the time. This driving situation is sure getting serious, you are not safe even sitting in a parked car, frankly I'm afraid to go anywhere anymore, half of the people driving around are just plain maniacs. I do hope you are insured Betty & also that the guy 1s able to get you a new car & pay all expenses for the personal injuries he inflicted on you & the demoralization he caused - the pain & suffering you must be going through. Well, not much I can say or do Betty, except again to tell you how deeply sorry both Eda & I are, & sincerely hope & trust you make a full recovery, its going to take time of course to get over the shock of it all. Was happy to note that you felt you were already starting to improve, which is a good sign & very encouraging, am sure with your will power & determination you will get well again, sooner than expected. So glad you have your TV set to give you enjoyment & pleasure & take your mind away from your troubles, this invention is certainly a God send to us all, do'nt know what I'd have done without it all this time I've been laid up. Please convey my regrets to Wayne, am sure he feels very unhappy about it all, but I know he will do everything possible to help you get back in shape again. I’m really scared to drive anymore with all these bloody maniacs on the road. Thanks yours 20th.inst. with enclosure of news clipping re run-away car, what a nightmare ride that must have been for the guy - can you imagine, it sure would have been a terrific scene for L&H, the amazing thing, nobody got hurt. I must remember that, it would make a wonderful routine, could be titled "Touch & Go"!. 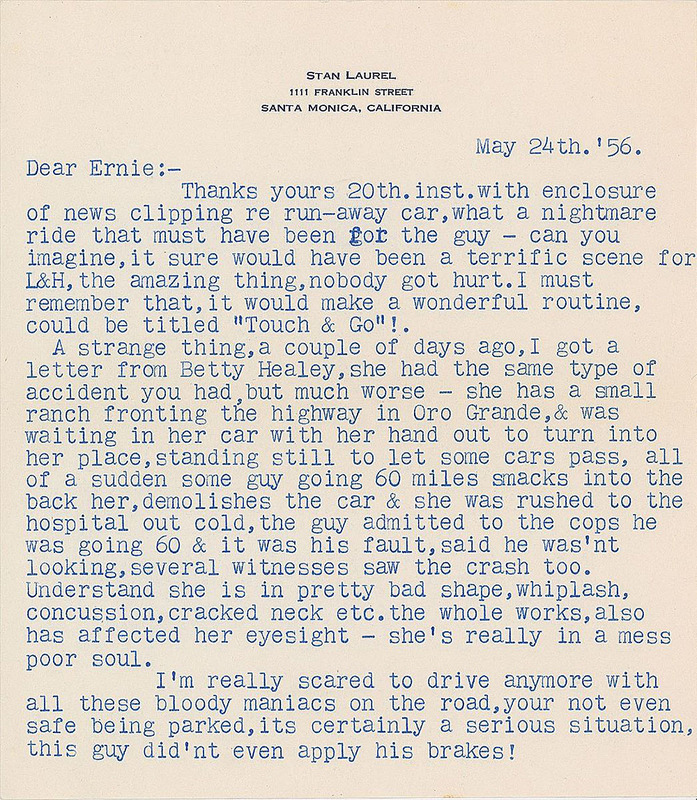 A strange thing, a couple of days ago, I got a letter from Betty Healey, she had the same type of accident you had, but much worse - she has a small ranch fronting the highway in Oro Grande, & was waiting in her car with her hand out to turn into her place, standing still to let some cars pass, all of a sudden some guy rolling 60 miles smacks into the back her, demolishes the car & she was rushed to the hospital out cold, the guy admitted to the cops he was going 60 & it was his fault, said he was'nt looking, several witnesses saw the crash too. Understand she is in pretty bad shape, whiplash, concussion, cracked neck etc. the whole works, also has affected her eyesight - she's really in a mess poor soul. I'm really scared to drive anymore with all these bloody maniacs on the road, your not even safe being parked, its certainly a serious situation, this guy did'nt even apply his brakes! I do'nt know if Betty was insured or not, regardless, it was a terrible thing to happen. Note you are going to a masseur, hope it will do you some good & put you in shape for the heavy weight crown, "Battling Kid Murphy" the Irish terrier! Manager, Bess "Wisecrack" Murph - what a combination!